This week felt like a lot of review. Wether it be review for our chapter test tomorrow or our midterm on Thursday, it was packed with previous learning. At the start of the week we focused on going and working ‘between’ different equations and changing them from one form into another. The three forms we covered are General Form, Factored Form and Standard / Vertex Form. We can interchange these formulas to give us different pieces we need for graphing. 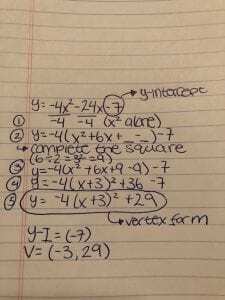 Therefore, if you were given an equation in General Form and you were asked to change it to Vertex Form you would use the method of completing the square. If the equation was . First, you would divide by -4 to get the by itself, then you will re-write your equation as . In order to find the numbers that go in the blank you will need to spilt the middle term and square it! (middle term being 6). That would give you 9, you then put the 9 in the 2 blank spots. Your equation will now be . Next you will create your binomial and multiply the -9 by -4 to be able to move it to the outside of the brackets. Your new equation will now be . The next step is to subtract the 7 from 36 leaving you with 29. Your new equation is . With this new equation we are now able to find the vertex of the parabola, if it is positive or negative (opens up or down), and if it is congruent to the 1,3,5 pattern used when graphing. Here is the same equation demonstrated on paper. First week back from Spring Break :/ … Here is my video on Graphing Quadratics!! This week was all about factoring and QUADRATICS!!! I just did a super long video (sorry) on what we have gone over thus far! Enjoy!! This week was primarily focused on Multiplying and Dividing Radicals. At first, trying to think back to rules and tricks from Math10 was a challenge but as the short week progressed, I got the hang of it. Dividing was the most difficult for me and I highlighted that in my Showme. (The hardest part for myself was to divide with conjugates, when the denominator was a Binomial). Hope you enjoy and this helps! This week was short. Monday we had our test for Sequences and Series, Tuesday we had a snow day, Wednesday we started review on Roots and Radicals with a new element of Absolute Value and today we continued with those ideas and completed the Checkpoint questions. This week was pretty low-key. 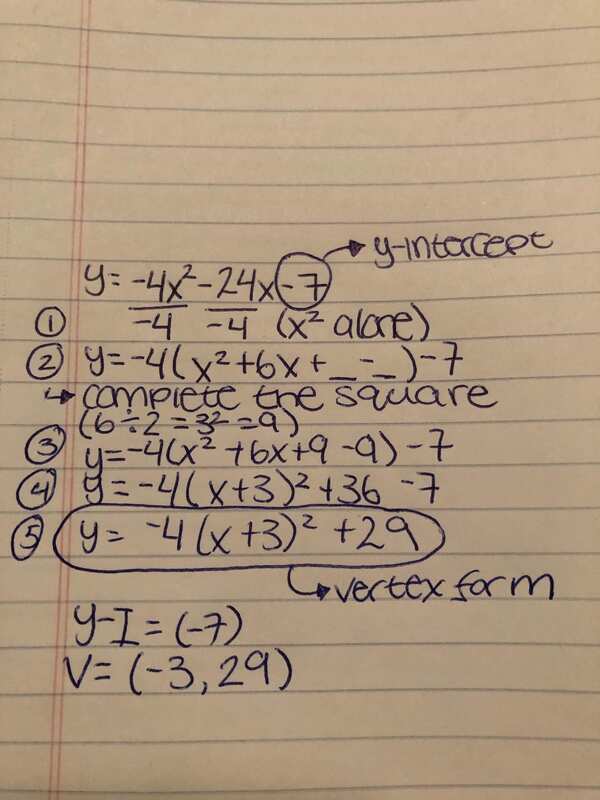 What I will be highlighting in my ShowMe, was what I struggled with most – When there is a fraction under a root sign. I enjoy attaching ShowMe’s as it allows my viewers to see the specific steps, along with hearing my voice; It has most learning styles included! Hopefully it works for you. As I said, you will be watching how to solve for a fraction being placed under a root sign, some mixed and entire radicals, along with a question or two of solving for an Absolute Value. This week wrapped up our first unit! It was generally based around Geometric Sequences and Series. For myself, it was a step higher from Arithmetic Sequences and Series and slightly more challenging. Due to formulas, solving the questions in the workbook came with ease… except word problems. Therefore, I thought I would demo one for my Blogpost this week! This week, being the first week of Precalculus, involved a lot of new feelings and knowledge. I found the first lesson fairly easy to grasp. Due to the formulas being provided, plugging in the corresponding information into that formula was the easy part… Because it was given to you. However, the most challenging piece I have been faced with over the last week would be when you had to solve for something that was not given to you directly at the beginning of the exercise. After numerous tries I finally got the hang of it. Provided bellows a question in which you have to solve for a part that is not there. Luckily with the help of algebra you can the answer! Step One : Plug in what you know! Step Two : Distribute the 4 into the brackets. Step Four: move the -4 to the opposite side.